We examined whole-body and muscle metabolism in patients with type 1 diabetes during moderate exercise at differing circulating insulin concentrations. Eight men (mean ± SEM age 36.4 ± 1.5 years; diabetes duration 11.3 ± 1.4 years; BMI 24.6 ± 0.7 kg/m2; HbA1c 7.9 ± 0.2% and VO2 peak 44.5 ± 1.2 ml kg−1 min−1) with type 1 diabetes were studied on two occasions at rest (2 h) and during 45 min of cycling at 60% maximum VO2 with insulin infused at the rate of either 15 (LO study) or 50 (HI) mU m−2 min−1 and blood glucose clamped at 8 mmol/l. Indirect calorimetry, insulin-glucose clamps and thigh muscle biopsies were employed to measure whole-body energy and muscle metabolism. Fat oxidation contributed 15 and 23% to total energy expenditure during exercise in the HI and LO studies, respectively. The respective carbohydrate (CHO) oxidation rates were 31.7 ± 2.7 and 27.8 ± 1.9 mg kg−1 min−1 (p < 0.05). Exogenous glucose utilisation rate during exercise was substantially greater (p < 0.001) in the HI study (18.4 ± 2.1 mg kg−1 min−1) than in the LO study (6.9 ± 1.2 mg kg−1 min−1). Muscle glycogen content fell by ∼40% during exercise in both trials. Muscle glycogen utilisation, muscle intermediary metabolism, and phosphorylation of protein kinase B/Akt, glycogen synthase kinase 3α/β and extracellular signal-regulated protein kinase 1 and 2 proteins were no different between interventions. In patients with type 1 diabetes, exercise under peak therapeutic insulin concentrations increases exogenous glucose utilisation but does not spare muscle glycogen utilisation. A disproportionate increase in exogenous glucose utilisation relative to the increase in CHO oxidation suggests an increase in glucose flux through non-oxidative pathways. Chokkalingam and Tsintzas are joint first authors. Exercise can play an integral role in the management of type 1 diabetes because of its blood glucose-lowering effect . Adjustments to insulin dose and carbohydrate (CHO) intake are generally necessary to reduce the risk of exercise-induced hypoglycaemia , and patients need to be proactive with their diabetes management to accommodate planned exercise . Current recommendations are for patients to reduce insulin doses prior to exercise , although in practice many patients continue with customary insulin doses and take additional CHO. The average preprandial and peak therapeutic insulin concentrations in patients using a basal bolus insulin regimen are typically 120–180 and 420–480 pmol/l, respectively [5, 6]. By contrast, in non-diabetic subjects, circulating insulin normally declines considerably to 30 pmol/l or less during exercise, and glucagon concentration increases in order to facilitate substrate mobilisation [7, 8, 9]. Depending on the exercise timing and its temporal relationship to the last insulin injection, patients with diabetes will therefore generally be carrying out exercise under markedly hyperinsulinaemic conditions, with an increased risk of hypoglycaemia . In healthy volunteers exercising under physiological hyperinsulinaemia [8, 10], exercise and insulin interact synergistically to increase glucose uptake. In contrast, patients with type 1 diabetes exercising at 50% maximum VO2 under basal insulin concentrations of about 60 pmol/l show reduced glucose uptake and greater reliance on fat oxidation compared with controls . However, when the intensity of exercise was increased to 70% maximum VO2, these differences were no longer present. In reality, typical everyday therapeutic insulin concentrations are often significantly greater than the concentrations employed in the above study  and not all patients with type 1 diabetes are able to carry out such high-intensity exercise. The impact of moderate exercise (60% maximum VO2) at normal therapeutic hyperinsulinaemic conditions on whole-body and muscle substrate metabolism in patients with type 1 diabetes has not been investigated. The underlying cellular mechanisms involved in regulating both insulin- and exercise-mediated glucose uptake are only partly understood. The phosphorylated forms of protein kinase B (PKB/Akt), glycogen synthase kinase 3 (GSK3) α and β isoforms and extracellular signal-regulated protein kinase (ERK 1,2, also known as EPHB2) are intracellular signalling targets potentially involved in the regulation of both insulin- and exercise-mediated glucose uptake [12, 13]. However, the impact of hyperinsulinaemia and exercise in patients with type 1 diabetes on these insulin-signalling targets is not known. 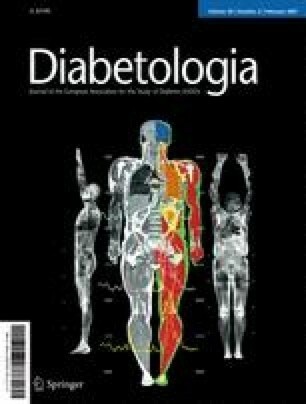 The aims of this study were to examine the effects of hyperinsulinaemia approximating preprandial and peak therapeutic insulin concentrations during moderate exercise on: (1) whole-body and muscle substrate metabolism in patients with type 1 diabetes; and (2) key insulin-signalling targets involved in the regulation of glucose uptake in muscle in patients with type 1 diabetes. We hypothesised that exercise under peak therapeutic insulin concentrations would increase glucose utilisation and oxidation and reduce reliance on intramuscular glycogen as a metabolic fuel. Eight recreationally active, C-peptide-negative men with type 1 diabetes were recruited. The mean ± SEM age and BMI were 36.4 ± 1.5 years and 24.6 ± 0.7 kg/m2, respectively. The mean duration of diabetes was 11.3 ± 1.4 years and they had reasonably well controlled diabetes with a glycated haemoglobin concentration of 7.9 ± 0.2%. Six patients were on a basal bolus subcutaneous insulin regimen and two were on twice-per-day premixed insulin injections. All patients were screened to exclude micro- and macrovascular complications. The patients’ mean VO2 peak was 44.5 ± 1.2 ml kg−1 min−1, as determined during a preliminary visit using an incremental cycling test (Excalibur cycle ergometer; Lode, Groningen, the Netherlands). The criteria used for attainment of VO2 peak were as follows: heart rate response >90% of predicted maximum heart rate; respiratory exchange ratio >1.10; near-maximal rating of perceived exertion (Borg scale ≥19); and a drop in pedalling rate greater than 20%. Patients were familiarised with the exercise protocol during pre-study visits to the laboratory, and were informed of all procedures and risks associated with the experimental procedures before they were asked to give informed consent. All procedures used in this study were performed according to the Declaration of Helsinki and approved by the Nottingham NHS Research Ethics Committee. Studies were carried out in the fasted state on two occasions in random order with a 2-week interval between visits. Volunteers maintained an isoenergetic diet and monitored their capillary blood glucose closely prior to the study. They were requested to avoid smoking, alcohol and exercise for 3 days prior to each study visit. The subjects omitted their medium-/long-acting insulin for 24 h prior to the study. On the evening prior to the study, subjects consumed a standardised high-CHO (2 g/kg) meal, injected their usual short-acting soluble insulin and were admitted to the hospital for a low-dose intravenous insulin infusion to maintain euglycaemia overnight. An antegrade cannula was inserted into a cubital fossa vein for insulin infusion. A retrograde cannula was inserted into a dorsal hand vein for blood sampling to measure glucose during the overnight stay and also for drawing arterialised blood samples the following day during the study with the hand placed in a hot-air box (55°C). At 08.00 hours the following morning the subjects were transferred to the metabolic unit for the study protocol. Resting VCO2 and VO2 were measured for 20 min using a ventilated hood system (GEM; Nutren Technologies, Manchester, UK) and the values were used for the calculation of resting energy expenditure and substrate oxidation rates. Measurements were made while the subjects were lying supine, undisturbed and awake. Intravenous insulin infusions were given at steady-state rates of either 15 or 50 mU m−2 min−1 (with an appropriate prime) in random order for a total of 3 h. The 15 and 50 mU clamps were designed to approximate typical preprandial (LO) and postprandial (HI) therapeutic insulin concentrations, respectively [5, 6]. Blood glucose was clamped at 8 mmol/l to approximate the average 24 h blood glucose levels observed in reasonably well controlled patients with type 1 diabetes . This also reflects a realistic blood glucose concentration that patients would aim for prior to exercise. Subjects rested in the supine position for the first 120 min of the study and blood samples were collected at regular intervals. A second resting indirect calorimetry measurement was made during the last 20 min of the resting period. Following this, patients cycled at 60% of peak VO2 for 45 min and the hyperinsulinaemic clamp was continued during cycling. Five-minute expired gas samples (Vmax 29; Sensormedics, Yorba Linda, CA, USA) and blood samples were collected every 15 min during cycling. Heart rate and a rating of perceived exertion using a Borg scale  were also measured at 15 min intervals during exercise. A muscle biopsy was obtained from the vastus lateralis under local anaesthetic before and after cycling, as described previously  but with suction applied to the end of the biopsy needle to improve tissue sampling. Two different biopsy sites from the same leg were used for muscle sampling on one visit and the contralateral leg during the second visit. The post-exercise biopsy was taken at least 3 cm distal to the first site to reduce experimental variability . The samples were immediately frozen in liquid nitrogen. Urine samples were collected during the overnight admission and during the study day for glucose and urea measurements. The urine samples were stored at −20°C in 10% thymol until analysis. Whole-blood and urine glucose and blood lactate were measured using a Yellow Springs analyser (YSI 2300 Stat Plus-D; Yellow Springs Instruments, Yellow Springs, OH, USA). All serum and plasma samples were stored at −80°C until analysis. Serum insulin and glucagon were measured using commercially available radioimmunoassay kits from Diagnostic Products (Llanberis, Gwynedd, Wales, UK) and plasma NEFA levels were measured using a kit from Wako Chemicals (Neuss, Germany). Whole blood β-hydroxybutyrate was measured in perchloric acid (10%)-treated blood samples . Plasma catecholamines were measured using high-performance liquid chromatography with electrochemical detection . Plasma and urine urea were determined using a commercially available enzymatic kinetic method (Randox Laboratories, Crumlin, Antrim, UK). Muscle samples were stored immediately in liquid nitrogen for later analysis. At a later date, 5–10 mg of the muscle biopsy specimen was freeze-dried and washed with 40% petroleum ether to remove fat. Muscle powdering, extraction and measurement of metabolites (free glucose, glucose 6-phosphate, lactate, ATP, phosphocreatine and creatine) were carried out as described previously . Acid hydrolysis of small portions of the muscle extract and of the muscle pellet left over after perchloric acid extractions was carried out to measure macro- and proglycogen, respectively. The resulting hydrolysates were used to determine the glucose residues enzymatically . Acetylcarnitine was determined enzymatically using a radioisotope assay . Total protein extracts were prepared from 10–20 mg of frozen biopsy tissue. Samples were first homogenised using a Polytron homogeniser for 30 s on ice in 10 volumes of buffer containing 50 mmol/l HEPES, 10% glycerol, 1 mmol/l EDTA, 10 mmol/l NaF, 1 mmol/l Na3VO4, 150 mmol/l NaCl, 1% Triton X-100 (pH 7.5) and the protease inhibitors 4-(2-aminoethyl)benzenesulphonyl fluoride (10 mg/ml), leupeptin (0.1 mg/ml) and pepstatin A (10 μg/ml). The homogenates were then centrifuged at 10,000×g for 20 min at 4°C and the supernatant fractions stored at −80°C until analysis. Protein concentrations of whole tissue extracts were measured using the BCA method (Pierce, Cramlington, UK). Proteins were separated using 5–20% gradient gels and then transferred overnight to Hybond-C nitrocellulose membranes (Amersham Biosciences, Little Chalfont, UK). After blocking with 5% BSA for 1 h at room temperature, the membranes were incubated overnight with primary antibodies for phospho-Akt serine473, phospho-GSK3α/β serine21/serine9 and phospho-ERK1 threonine202, phospho-ERK2 tyrosine204 (Cell Signaling Technology, Danvers, MA, USA), and desmin (Sigma-Aldrich, St Louis, MO, USA) was used as a control. This was followed by incubation for 1 h at room temperature with secondary antibodies [goat anti-rabbit horseradish peroxidase (HRP) for Akt and GSK3, Amersham Biosciences; goat anti-mouse HRP for ERK 1/2, DakoCytomation, Denmark]. All immunoreactive proteins were visualised using ECL plus (Amersham Biosciences) and quantified by densitometry using the Gene Tools version 3.0 software (SynGene Division of Synoptics, Cambridge, UK). Exogenous glucose utilisation was calculated from the glucose infusion rates achieved during the insulin-glucose clamp . Calculations were made at steady state during the resting period of the clamp (90–120 min) and during the entire 45 min period of the exercise. The glucose infusion rate was corrected for glycosuria. Fasting-, insulin- and exercise-mediated CHO and fat oxidation rates were calculated from the VO2 and VCO2 measurements . Substrate oxidation at rest was corrected for protein oxidation using urinary urea concentration and for changes in the blood urea pool during the experiment . Statistical analysis was carried out using the software package SPSS version 11.5. Two-way ANOVA (treatment and time) was used to compare data from repeated measures. Student’s t test (two-tailed) was used to compare paired data within each infusion rate or at corresponding time points between infusion rates where appropriate. A p value less than 0.05 was considered significant. All data are expressed as mean (SEM). All eight patients completed the resting part of the experimental protocol and seven completed the exercise protocol on both visits. The eighth subject was unable to complete the exercise protocol on his visit for the HI trial. He managed to cycle for 25 min and had to stop because of undue exhaustion. Hence, only resting data are presented for this subject. The subjects cycled at a mean workload of 140 ± 9 W during both the LO and the HI trials. The mean oxygen consumptions during exercise were 29 ± 2 and 29 ± 1 ml kg−1 min−1 in the LO and HI trials, respectively, being almost exactly 60% of the predetermined maximal aerobic power. Blood glucose concentrations at rest were 8.8 ± 0.4 and 8.3 ± 0.3 mmol/l during the LO and HI trials, respectively. During exercise, glucose concentrations were 8.1 ± 0.5 and 8.1 ± 0.4 mmol/l, respectively. The serum insulin concentrations at rest were 168 ± 18 and 456 ± 30 pmol/l during the LO and HI trials, respectively (Fig. 1a). During exercise, there were further modest increases (p < 0.05), to 210 ± 18 and 576 ± 42 pmol/l, respectively, despite the insulin infusion rates remaining constant. Fasting plasma NEFA concentrations were comparable in the two interventions and were suppressed with the insulin infusions at rest and during exercise (Fig. 2). However, plasma NEFA concentrations were lower in the HI trial (p < 0.01). Baseline β-hydroxybutyrate concentrations were comparable (LO, 0.4 ± 0.1 mmol/l; HI, 0.4 ± 0.1) and were suppressed to concentrations below 0.1 mmol/l during both interventions at rest and during exercise. Blood lactate concentrations increased during insulin infusion, with higher values achieved during the HI clamp at rest (LO, 0.5 ± 0.1 mmol/l; HI, 0.7 ± 0.1 mmol/l; p < 0.05). There was a further increase during exercise but there was no significant difference between trials (LO, 2.3 ± 0.5 mmol/l; HI, 2.7 ± 0.6 mmol/l; treatment effect not significant). Serum glucagon concentrations were suppressed by insulin infusions after 30 min in the HI trial (p < 0.05) and did not increase during exercise, with no differences between studies (Fig. 1b). There was a marked exercise-induced increase in plasma noradrenaline concentrations during both interventions (p < 0.05) but only a non-significant increase in plasma adrenaline was observed. However, there was no difference in catecholamine concentrations between studies at rest or during exercise (Fig. 3a,b). At rest, insulin-stimulated exogenous glucose utilisation was higher in the HI than in the LO trial (p< 0.001; Table 1). During both studies, the exogenous glucose utilisation rate increased substantially to maintain concentrations at ∼8 mmol/l when patients changed posture from the supine to the ambulant state. The exogenous glucose utilisation rate increased considerably further (p < 0.001) during exercise in both studies but more so in the HI trial (change, 11.3 ± 1.5 mg kg−1 min−1) compared with the LO trial (difference, 4.6 ± 1.1 mg kg−1 min−1; Table 1). Exercise also induced a substantial increase in CHO oxidation during both trials, but it was 15% greater during the HI trial than during the LO trial (difference, 3.7 ± 1.4 mg kg−1 min−1; p < 0.05; Table 1). During exercise, fat oxidation contributed ∼23 and 15% of total energy expenditure in the LO and HI trials, respectively (not significant; Table 1). There was no difference in the mean rating of perceived exertion (Borg scale) during exercise between interventions (LO, 13.3 ± 0.6; HI, 13.1 ± 0.6). Data are mean (SEM). Values for insulin + rest are the means for the final 30 min of the clamp at rest; values for insulin + exercise are the means for the whole 45 min of the exercise period. Pre-exercise muscle glycogen concentrations were comparable between trials and were reduced by 40–43% after exercise (Table 2). The rate of glycogen utilisation during exercise was similar during the two interventions (LO, 3.9 ± 0.6; HI, 4.1 ± 0.6 mmol glucosyl units kg dry muscle−1 min−1). There were no differences between interventions in either pro- or macroglycogen utilisation rates. There was no significant increase in intramuscular free glucose concentration during either intervention. There was a three- to fourfold increase in muscle lactate and acetylcarnitine concentrations during exercise, with no differences between interventions (Table 1). The phosphocreatine/ATP ratios before and after exercise during the LO (2.7 ± 0.1 and 2.9 ± 0.2) and HI clamps (2.9 ± 0.2 and 2.8 ± 0.2) were not different. Data are mean±SEM millimole glucosyl units per kilogram dry muscle for glycogen and millimole per kilogram dry muscle for metabolites. Phosphorylations of Akt, GSK3α, GSK3β, ERK1 and ERK2 were similar at the end of the 2 h insulin infusions, with no significant differences between the LO and HI trials. Superimposition of exercise on the hyperinsulinaemic conditions did not alter the phosphorylation of these signalling targets and there were no differences between trials (data not shown). The principal finding of this study was that exercise under peak therapeutic hyperinsulinaemic conditions in patients with type 1 diabetes did not spare muscle glycogen utilisation at a time of high exogenous glucose utilisation and oxidation. Muscle intermediary metabolism during exercise was not affected by changes in therapeutic insulin concentrations seen routinely in clinical practice (150–540 pmol/l). The insulin-mediated phosphorylation of key signalling targets during exercise did not differ between the two insulin concentrations used. In patients with type 1 diabetes, exercise under hyperinsulinaemic conditions has a synergistic influence on whole-body glucose utilisation. During exercise, the exogenous glucose infusion rate was substantially increased in both studies to prevent a fall in blood glucose. The amount of glucose infused was substantially higher in the HI trial (68 g) than in the LO trial (25 g) to maintain blood glucose at 8 mmol/l. Hence, it might have been expected that muscle glycogen would have been spared during the HI trial, but no such differences were observed. Moreover, we did not observe any difference in the concentration of either intramuscular free glucose or glucose 6-phosphate. Intramuscular lactate accumulation (an index of the rate of glycolysis) and acetylcarnitine concentration (an index of pyruvate flux through the pyruvate dehydrogenase complex ) were similar during the two trials. Moreover, superimposition of exercise on the hyperinsulinaemic conditions did not influence the phosphorylation of Akt, GSK3α and β and ERK1/2. This is contrary to previously reported findings in healthy volunteers and rats [12, 13, 26, 27]. It is possible that the hyperglycaemic conditions could have had an inhibitory effect on Akt activation, as observed in patients with type 2 diabetes . The above data indicate that at least some of the additional increase in glucose uptake during exercise, especially in the HI trial, might not have entered contracting muscle. This is in agreement with a previous study which assessed glucose disposal in patients with type 1 diabetes during one-legged isometric exercise under hyperinsulinaemic conditions using 5-fluorodeoxy glucose positron emission tomography . These results suggest the presence of impaired skeletal muscle insulin-stimulated glucose uptake in patients with type 1 diabetes and further investigations are required to confirm this hypothesis. In the present study, exercise induced a substantial increase in CHO oxidation in both trials. However, the rate of CHO oxidation in the HI trial was only slightly greater (∼15%) than that in the LO trial. Under fasting conditions, fat oxidation can contribute up to 40% of energy needs during exercise at moderate intensity in healthy volunteers . However, in the present study the hyperinsulinaemic conditions appear to have impaired the exercise-induced increase in catecholamine-mediated lipolysis . As a result, fat oxidation contributed to less than a quarter of the total energy used to meet the needs of the exercising muscle. Since plasma NEFA availability was suppressed under these conditions, the source of the fat that was oxidised was likely to have been intramuscular triglyceride stores, as seen in other studies [31, 32]. Hence, hyperinsulinaemia limits fat utilisation, thereby increasing CHO oxidation and hence glucose requirements. Exercising with type 1 diabetes is not straightforward. We observed significant increases in insulin concentrations during exercise in both trials without any change in the insulin infusion rate. This is likely to have been due to reduced clearance. Hence, under real-life conditions exercise not only increases absorption from subcutaneously administered injection depots but also might decrease insulin clearance, leading to high circulating insulin levels during exercise, and increase the risk of exercise-induced hypoglycaemia. Current recommendations are to reduce short-acting insulin doses immediately prior to exercise and to take modest amounts of CHO during exercise to prevent hypoglycaemia. However, even with reductions in soluble insulin dosages, patients will often be exercising at insulin concentrations similar to those observed in the LO study (∼150 pmol/l), well in excess of the insulin levels seen in non-diabetic subjects during exercise (∼30 pmol/l). Some patients do not reduce insulin doses prior to exercise, but choose instead to take larger amounts of CHO to forestall hypoglycaemia. Furthermore, patients do not always find it possible to plan meals, insulin doses and exercise rigorously. In practice, exercise is therefore often undertaken at higher postprandial insulin concentrations (similar to the HI study) requiring additional CHO intake. The comparative physiology of these two situations has not been described previously in patients with type 1 diabetes. We have shown here for the first time that, in patients with type 1 diabetes, exercise under differing insulin concentrations is associated with similar energy expenditures and muscle glycogen utilisation rates despite the substantial increase in exogenous glucose utilisation in the HI trial compared with the LO trial. Since it is difficult to estimate precisely the mass of working muscle, it is difficult to quantify the contribution of muscle glycogen to whole-body CHO oxidation. Nevertheless, the amount of muscle glycogen utilised was similar in the two trials and there was a significant increase in CHO oxidation on both occasions, with a slightly greater value observed in the HI trial. Interestingly, the increase in exogenous glucose utilisation relative to the increase in CHO oxidation was much greater in the HI trial compared with the LO trial. This suggests that some of the additional increase in whole-body glucose uptake during exercise in the HI trial might have been directed away from the contracting muscle towards non-oxidative pathways in other tissues. Further studies are required to confirm whether glucose storage occurs in the liver and/or non-contracting muscle tissue during exercise under such conditions. If the site of deposition of excess glucose was indeed the liver, this might potentially reduce the risk of ‘late’ hypoglycaemia. However, there would be a considerable risk of hypoglycaemia occurring during exercise at high insulin concentrations if CHO intake were not increased to match energy expenditure. This study illustrates that even at typical preprandial insulin concentrations (as seen in the LO trial) substrate metabolism during exercise in patients with type 1 diabetes is far from normal, with a low rate of fat oxidation, marked muscle glycogen utilisation and a need for considerable quantities of exogenous glucose to meet energy needs. Exercising at higher, typically postprandial, insulin concentrations increases exogenous glucose utilisation but does not spare muscle glycogen breakdown. In order to further understand the physiological responses to exercise in patients with type 1 diabetes, additional studies are required to investigate the impact of peak insulin concentrations on exercise capacity and muscle fatigue and the role of liver glycogen in maintaining glycaemia during and after exercise. We gratefully acknowledge the Special Trustees for Nottingham University Hospital for providing the funding to carry out the study. We would also like to thank M. Bloc, J. Littlewood, S. Sarmad and S. Cordon for their technical assistance during the patient studies and analytical work. We declare no conflict of interest with reference to any work carried out in this study.